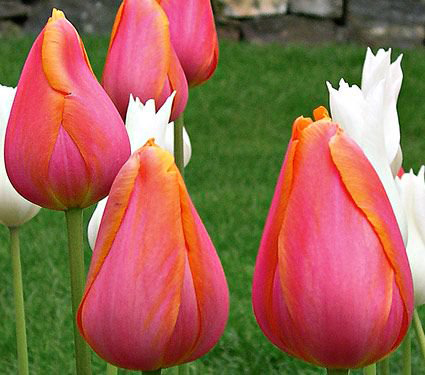 The best way to encourage long life from your Tulip bulbs is to plant them deep. 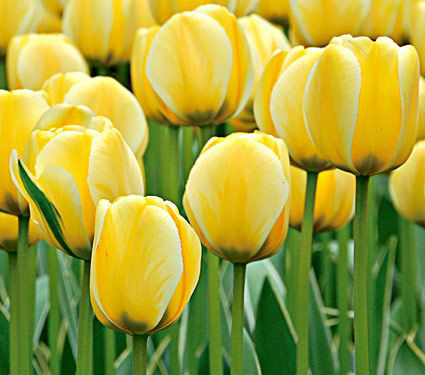 Try for a depth of 8-10 inches for full-size Tulips. That’s far deeper than any of those coring-type bulb planters will ever reach. The hand-corers also encourage repetitive motion problems if you’re planting more than half a dozen bulbs. So arm yourself with something heftier. We love our specialized bulb planters, for prepared soil or for naturalizing. The foot-powered tools dig deeper, and with far less effort, than a hand-powered one. The fastest way to plant bulbs involves two gardeners: one to dig, one to plant. 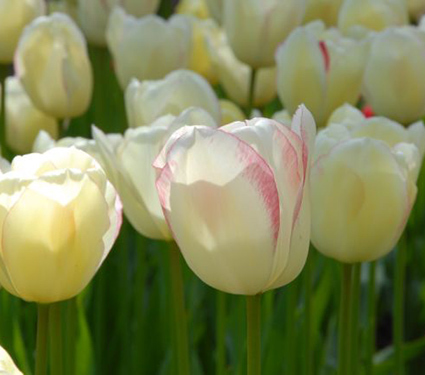 To plant each bulb, create a deep slot by inserting the planting tool into the ground and pushing forward. Your assistant follows and pushes the bulb into the slot, then steps on the loose soil to push it back into place. The second tip: water when you’re finished planting. This helps settle the soil, and the moisture will trigger root growth, although it’s not obvious above ground, bulbs send out roots at this time of year, so they will be ready to burst into bloom when spring arrives. It’s also a great idea to scatter some bulb fertilizer after you plant. We suggest a formula low in nitrogen and high in potassium for the best results. Squirrels have an uncanny ability to discover a spot where someone has very recently buried a tasty little bulb. Deep planting discourages squirrels, who rarely scratch down more than a few inches. But they might find Crocuses, since they are planted just three to five inches deep. If squirrels are a serious issue, we recommend laying a piece of hardware cloth or small-gauge poultry wire fencing over a newly planted area. You can take if off in a couple of weeks, after rain and watering has settled the soil and removed all telltale signs of planting.